Meal prep is something I dread- let’s just get that out of the way. Really, we both know that anything that has to be done EVERY week or EVERY day is something I dread 🙂 However, I discovered early on in this Work From Home game, that I can easily waste my whole day in the kitchen creating inspired and elaborate dishes, so the prepping must be done. Egg Frittata is one of my favorite recipes to prep for the week. It’s super simple and oh so delicious! It’s also easily customized and perfect for sharing! Fancy kitchen tools required: A pan that can go from stove top into the oven. I bet you’re starting to understand why this is my go-to recipe for breakfast meal prep! You can add anything you want to this recipe to make it fit your macros. It’s well-balanced with carbs, protein and fat that can be adjusted easily to fit your diet. When I’m not cutting, I use whole eggs, but lately I’ve used egg whites, beaters or a combo. Add olive oil and onions to your stove to oven pan and sauté over medium heat for 2-3 minutes. Add meat, potatoes and any other veggies or spices and continue cooking for about 5-10 minutes or until cooked to your liking. Meanwhile, pour/crack eggs into a large bowl and whisk until blended. Add salt and pepper to taste. 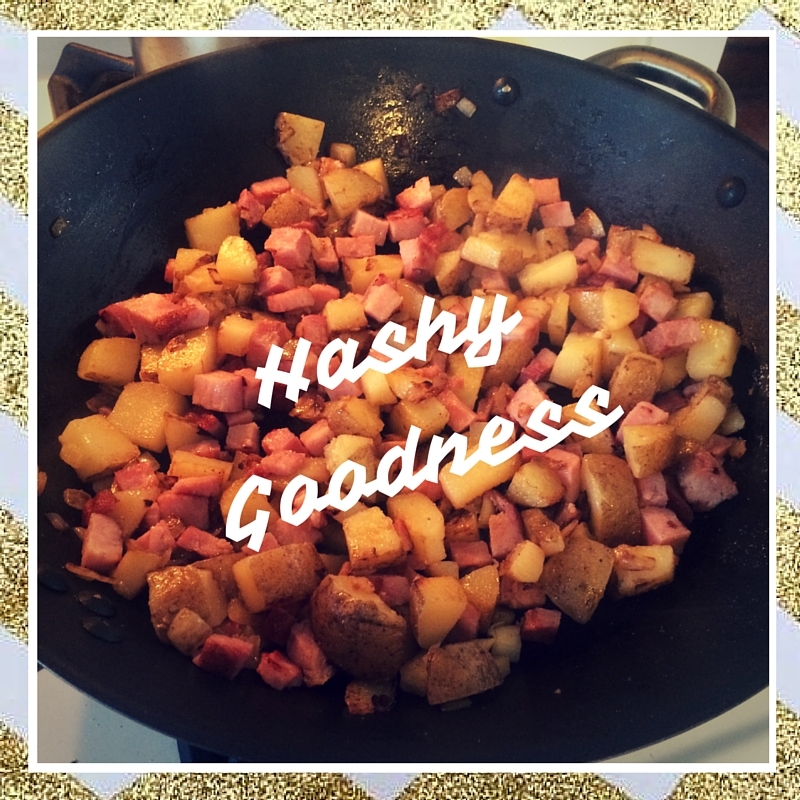 Once you’re satisfied with your hash base (warning: it is very tempting to eat the hash you just created 🙂 ), shake the pan to evenly distribute it and then pour the eggs overtop. Optional: I like to sprinkle some parsley on top of the eggs if I’m not adding cheese. Let the eggs cook on medium heat until the sides are firm. I usually eat some, then cut into big slices and store in tupperware for easy grab and go breakfast. Lasts for about a week in the fridge! Find my Egg, Ham and Potato Frittata recipe on MyFitnessPal here for nutrition and simple tracking! Next Happy is Pretty. And Life Changing!